Information Technology has become an essential component of contemporary society, allowing much faster and more widespread communication, not least through the growth of the Internet. However, many issues concerned with the human aspects of the use of IT remain problematic despite technological advances. An enhanced ability to collect and process data, or to communicate electronically across time and space, does not necessarily lead to improved human communication and action. 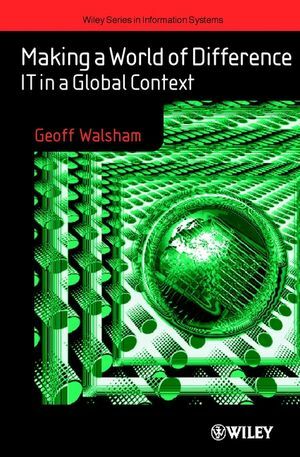 This book explores the social aspects of computerisation, using a wide range of detailed case studies, analysed from a variety of conceptual viewpoints. A further distinctive feature of the book is that it draws on empirical material from across the world as a whole, including non-Western countries. It is argued that we should be using IT to support a world in which diversity and difference are respected. Making a World of Difference provides a context for the whole debate about the relationship of people and computers. It looks at the role of IS/IT in a modern society and the way it impacts on people, companies, economics etc. Prof. Walsham readily acknowledges that this environment is rapidly changing and that it is therefore important not to focus too closely on current technologies or one particular system of thought, but consider them as one of many other alternatives. It is structured to be of use for academics and business audience - Part 1 is holistic and reflexive, while Parts 2 and 3 are written for the busy manager who can consider the key issues independently. GEOFF WALSHAM is a Research Professor of Management Studies at the Judge Institute of Management Studies, Cambridge University, UK. His teaching and research is centred on the development, management and use of computer-based information systems, and the relationship of information and communication technologies to stability and change in organizations and societies. He is particularly interested in the human consequences of computerization in a global context, including both industrialized and developing countries.